Ubisoft is turning Sam Fisher into a comic book hero. Have you ever wondered what happened to our good friend Sam Fisher during the time between Splinter Cell: Conviction and the upcoming Splinter Cell: Blacklist? 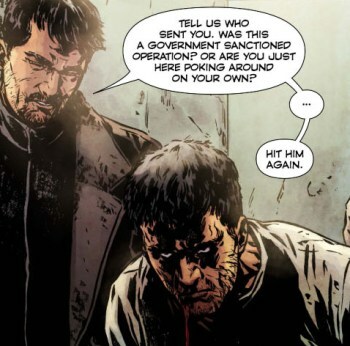 Me neither, but on the off-chance that some people might, Ubisoft is covering that base with Splinter Cell: Echoes, an upcoming graphic novel written by Nathan Edmondson and illustrated by Marc Leming. "Splinter Cell: Echoes bridges the events of Splinter Cell: Conviction and Blacklist," Edmondson told IGN. "I can't say much more than that at this point, as Sam Fisher's path has some very interesting turns post-Conviction." Edmondson said he came to the attention of Ubisoft by way of The Activity, a "military thriller" published by Image Comics. That series, Edmondson told USA Today earlier this year, has "no sci-fi twists, no aliens, no time-travel - just grounded thriller action, bleeding-edge tech and a high-stakes journey through modern warfare." While the book ties in directly to the videogame franichse, Edmondson said non-gamers will be able to enjoy it as well. "There's certainly some fun fan-service in there, but we treat the characters and story in the same way we would if this was our original creation," he added. Splinter Cell: Echoes is slated for release sometime in 2013, probably not too far off the release of Splinter Cell: Blacklist, which comes out on the Xbox 360, PlayStation 3 and PC on March 29 of the same year.